The Question that Set me Free from my Unhappiness. Last Christmas Eve, rather than being at home, being a good wife and a loving mother, I left home. I ditched the kids and abandoned my husband who was baking in the kitchen and I ran all over town until I found a tattoo artist who could ink me. Without question or doubt, I knew that this was the day I had to get these words tattooed on my body. That day I needed it to be part of my being. As my house filled with people, presents and the pressure of it all, I needed a reminder of the problemlessness of it all. What if there is no problem? The world stopped. Everything since that moment has changed for the better. I couldn’t just write this down on a piece of paper. I needed a permanent reminder of this question that would become my personal mantra. I needed to look at this every minute of every day. Because for the first time in my life I had a handle on how to get some freaking inner peace. 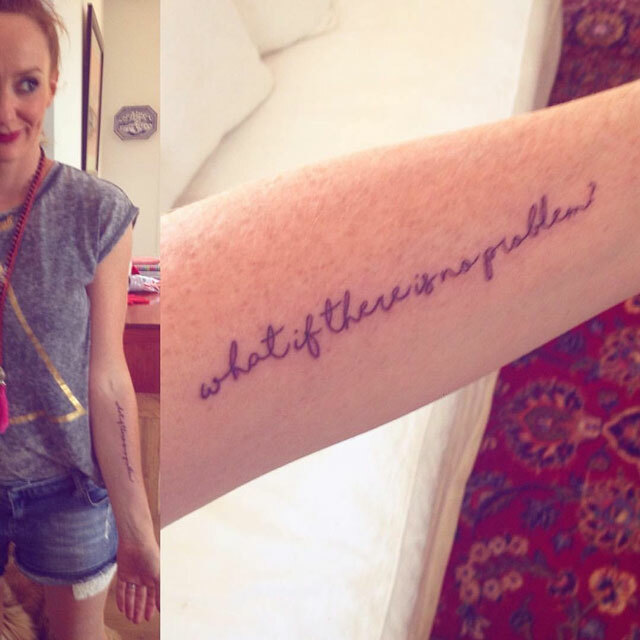 I needed that tattoo as a declaration of personal transformation. The transformation in me came from a simple realisation—I am not a problem. I had been pathologising myself for as long as I could remember. Want the recipe for permanent unhappiness? I had it. I fixated on the belief that, when I sorted out the problem that was me, everything would make sense. I kept myself miserable and suffering for a long time. As a spiritual seeker I was particularly good at using personal development as a weapon of self-destruction. I could identify all my personal failings and the back story to them with ease. But it brought me no peace. I was always at odds with myself. In that moment of cracking open what was concealed for so long became clear. The perfect version of me didn’t exist. The need for it kept me from my own happiness. And the problems of my life, well, were they? No matter how grievous or painful or humiliating or shameful or despairing or enraging my experiences were, they were just life. It was my story about them that made them good or bad. And when I saw it in that way I was free to live my life. I was no longer defeated by it. This radical acceptance made me recognise that I wasn’t a baking mama. I am an out getting tattooed on Christmas Eve mama. But this is not the end of the story. As I went deeper into my own self-acceptance, something remarkable happened in my relationship with the world. What if all the problems are not a problem? I noticed as observed from this perspective that we are attuned to look at the events of the world as a problem. We are entrained into the problemitisation of life. We are taught to measure our reality by what we do not yet have or that which we have lost. We are not trained to accept that this is just life happening. And good or bad, this too, shall pass. When we switch the filter from “problem” to “acceptance” the fear begins to dissipate. I am not suggesting for one minute that the problems stop. The problems don’t stop. In fact the more awake we become to ourselves, the more aware we are that the problems of the world are endless. But our worry doesn’t transform the situation we are experiencing or seeing. It only adds to it. What if I stop seeing problems at all? What might just change the world, just as it changed me, is the shift in perspective. Reducing the world to its problems doesn’t let us embrace reality as a continuum of experience. It is life happening. This shift set me free to act. I moved from overwhelm to empowerment, emboldened by my acceptance of what is. In accepting what is, I could take action to make necessary change. Acceptance of myself was the gateway to my personal peace. Shifting my perspective was as simple as changing my focus. Surrendering judgement is a radical act. But it is possible. I began by letting go of the addiction to judging myself. Next up, I stop judging the world. And perhaps, the peace I found in me can be found out there too. Getting Inked: The Deeper Meanings of Tattoos. I can’t thank you enough for sharing! Your message rang so true for me! I’m thinking of how I can embed the message in my daily life! From another extreme self-critic. Thank you for reminding me to be kind to myself. I’m perfect just the way I am AND there are no problems! I gasped when I heard the question. I love when something rings so true, hits you in that This-is-it place of your soul. 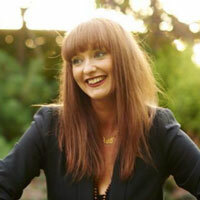 Ricci-Jane Adams is a self-declared intuition geek, totally obsessed with the science of intuition and how to get fearless by learning to listen to the Universe. Ricci-Jane has a PhD in magical realism (yes, it is possible). She lives in Melbourne, Australia with her much-neglected husband and two awesome boys who often wonder where mummy has gone when she says she is off on a soul-seeking adventure (check the nearest tattoo studio). Connect with Ricci-Jane via her website or Facebook.